Although 3D scanning has become a widely-used technique, most commercially available systems acquire data at relatively low rates and require careful control over the setup and calibration of cameras and/or active light sources. We are working on making range scanning systems faster, more flexible, more robust, and easier to use by developing novel scanner designs and 3D scan processing algorithms, including combinations of structured light, spacetime stereo, photometric stereo, and efficient registration algorithms. 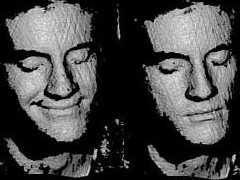 Computer Vision and Pattern Recognition (CVPR), 2008. ACM Transactions on Graphics (SIGGRAPH 2005), 24(3), August 2005. ACM Transactions on Graphics (Proc. ACM SIGGRAPH), 2007. Non-Rigid Global Alignment Using Thin-Plate Splines. Benedict J. Brown and Szymon Rusinkiewicz. ICCV 2005 Course on "3D Scan Matching and Registration"